The chemistry of silica has been extensively studied over the centuries, and has applications in glassware and optics, and more recently in creating nano-sized particles. We have recently developed methods to use organosilicate chemistry to synthesize particles with functional architectures for applications in nanobiotechnology and nanophotonics. Using the Stöber sol-gel process, we can grow particles from tens of nm to microns in diameter, simply by varying the catalyst and precursor concentrations. This control also allows us to grow core-shell particles with different components in the core and shell layers to make multi-functional materials. 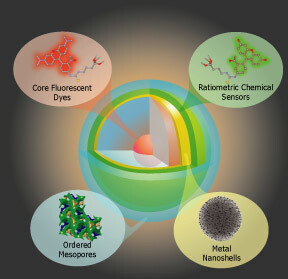 J. Choi, A. Burns, R. Williams, Z. Zhou, A. Flesken-Nikitin, W. Zipfel, U. Wiesner, A. Niktin, "Core-shell silica nanoparticles as fluorescent labels for nanomedicine" Journal of Biomedical Optics 12 (6) 064007-(1-11) (2007). A. Burns H. Ow, U. Wiesner, "Fluorescent core-shell silica nanoparticles: towards 'Lab on a particle' architectures for nanobiotechnology" Chemical Society Reviews 35, 1028-1042 (2006). W. Stoeber et al., J. Coll. Int. Sci. 26, 62 (1968). The heart of our work in functional core-shell silica nanoparticles is the development of fluorescent particles based on organic dyes covalently incorporated into the silica matrix. Reactive dye molecules are cross-linked to a silica precursor, which is reacted to form a dye-rich core particle. This core is then encapsulated in a layer of pure silica to create the core-shell particle. This encapsulation process combines the versatility and functionality of organic dyes with the stability and biocompatibility of the silica surface. Beyond simply combining the properties of the dye and silica, this architecture has been shown to actually enhance both the brightness and stability of the dyes, compared to the free dye in solution. Investigating these enhancements with Fluorescence Correlation Spectroscopy (FCS) and other advanced optical spectroscopy methods is a major goal of the Wiesner research group. We have demonstrated these enhancements in a number of dyes throughout the visible spectrum and are continually developing new particles for applications in biology and photonics. Amorphous silica is an excellent host material for a wide variety of functional materials, including fluorescnt dyes, metal nanoparticles and biomolecules. Further, it can be tailored to create architectures unachievable in such functional materials. One of the goals of our work in silica nanoparticles is the integration of multiple functionalities to create so-called lab-on-a-particle architectures, which would be capable of specific, localized multi-parameter analyses which are not possible using current technologies. 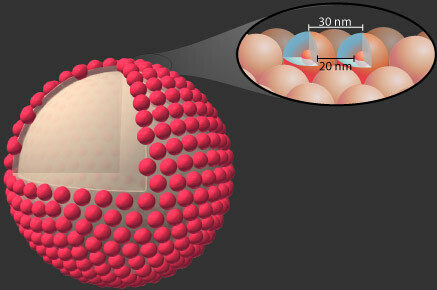 The core-shell C dot concept, which we originally demonstrated as a fluorescent probe, and has been expanded to include shells capable of environmental sensing can be further expanded to incorporate other functionalities such as drug release and surface plasmon resonance. Each of these capabilites have been previously demonstrated in silica-based materials, and we propose to integrate them into the modular C dot architecture where different functionalities can be incorporated into different shells to create probes tailored to specific investigations. For example, the multi-shell architecture shown above integrates a stable fluorescent probe with environmental sensing (e.g. pH, Calcium) with a gold nanoshell for NIR plasmon imaging and a templated mesoporous outer shell for drug delivery. This particle could be used for in situ analysis of localization, uptake, release and treatment by a therapeutic agent both in vivo and in cell culture, which could be of interest for drug development and nanomedicine applications. E. Herz, A. Burns, S. Lee, P. Sengupta, D. Bonner, H. Ow, C. Liddell, B. Baird, U. Wiesner. "Fluorescent core-shell silica nanoparticles: an alternative radiative materials platform", Proceedings of the SPIE Vol. 6096: Colloidal Quantum Dots for Biomedical Applications, 1-12 (2006). 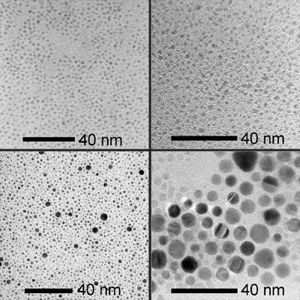 H. Ow, D. Larson, M. Srivastava, B. Baird, W. Webb, U. Wiesner,"Bright and Stable Core-Shell Fluorescent Silica Nanoparticles", Nano Letters 5 (1), 113-117 (2005). Photonic materials have garnered interest in many fields for their promise of increasing the basic understanding of light-matter interactions as well as practical applications such as low threshold lasing, optical computing, and light emitting devices. Through the CCMR IRG Program, we are collaboratively investigating these materials with the Liddell, Gaeta and Lipson Groups here at Cornell. Of particular interest within the field of photonic materials are bandgap materials. By their periodic structure, these types of materials confine or exclude specific wavelengths (or energies) of light. These periodic structures are on the order of the wavelength of light. The materials used to create these structures include colloidal crystals, etched silicon and other "photonic building blocks." One subset of these materials is known as "active photonic building blocks" which incorporate an optically active moiety, such as an organic fluorophore. With the Liddell Group, we have developed and investigated these active photonic building blocks (incorporating C dots) and the structures produced from them. Unfortunately, fluorophores suffer from proximity quenching and photobleaching in these situations. 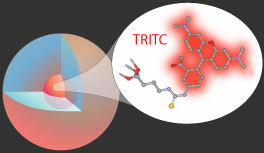 Proximity quenching occurs when one fluorophore is close enough to another to allow for excited state energy transfer. Hence, organic fluorophores have an intrinsic upper limit to the concentration with which they may be incorporated in a material. If the organic fluorophore is encapsulated within a core-shell environment of silica, it can no longer energy transfer energy with its neighbors. Additionally, these small (e.g. 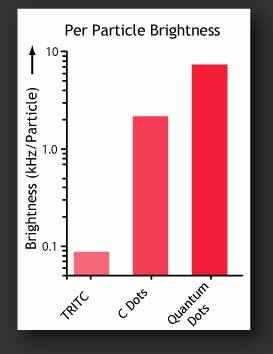 30nm diameter) particles may then be incorporated onto larger particles, such as ZnS spheres to make a raspberry type of structure. In this way, the fluorescent core-shell particles may be assembled into a photonic material with no proximity quenching and lowered photobleaching, as well as improved environmental stability. Mesoporous silica with cubic symmetry has attracted interest from researchers for some time. In our group, we synthesized mesoporous silica nanoparticles with cubic Pm3n symmetry with very high molar ratios (>50%) of 3-aminopropyl triethoxysilane at room temperature. The synthesis is robust allowing, for example, co-condensation of organic dyes without loss of structure. By means of pore expander molecules, the pore size can be enlarged from 2.7 to 5 nm, while particle size decreases. Adding pore expander and co-condensing fluorescent dyes in the same synthesis reduces average particle size down to 100 nm. 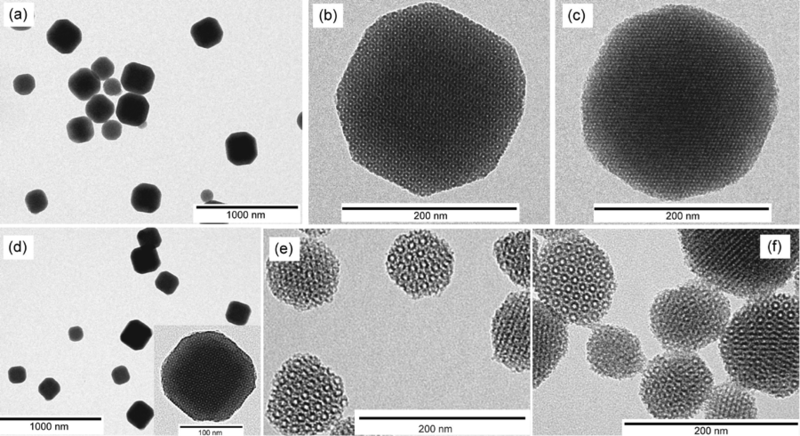 TEM images of (a) NH2-MSNs at low magnification, (b) NH2-MSN at  projection, (c) NH2-MSN at  projection, (d) TRITC-labeled NH2-MSNs (inset: high magnification image at  projection), (e) large-pore NH2-MSNs, and (f) TRITC-labeled large-pore NH2-MSNs. 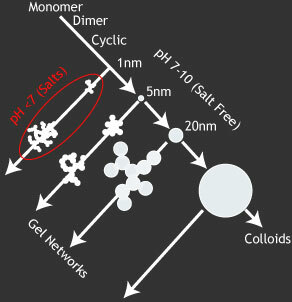 SAXS patterns of (a) acid-extracted and (b) calcined NH2-MSNs and (c) acid-extracted TRITC-labeled NH2-MSNs. 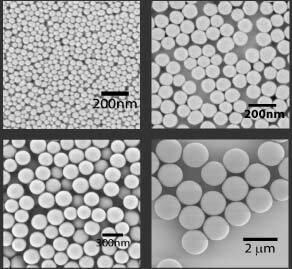 Teeraporn Suteewong, Hiroaki Sai, Roy Cohen, Suntao Wang, Michelle Bradbury, Barbara Baird, Sol Gruner, Ulrich Wiesner, "Highly Aminated Mesoporous Silica Nanoparticles with Cubic Pore Structure" J. Am. Chem. Soc. 133, 172-175 (2011). We are also interested in studying the assembly of metal nanoparticles with block copolymers. 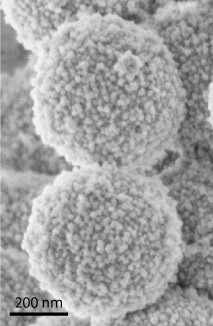 In order to prepare metal nanoparticles for assembly, the solubility of the particles needed to be drastically increased, as typical metal nanoparticles have extremely low solubility. We designed a thiol-based ionic liquid, which imparts liquid-like properties to the nanoparticles. This synthetic route can be used for preparing liquid nanoparticles of a range of compositions. Top left: platinum. Top right: palladium. Bottom: gold nanoparticles of two different size distributions. S. Warren, F. DiSalvo, U. Wiesner. "Nanoparticle-tuned assembly and disassembly of mesostructured silica hybrids" Nat. Mater. 6 (3), 156-161 (2007). A. Jain, U. Wiesner. "Silica-Type Mesostructures from Block Copolymer Phases: Formation Mechanism and Generalization to the Dense Nanoparticle Regime." Macromolecules 37, 5665 (2004).